What a delicious start to a new series! This was a fast paced mystery with an interesting and diverse cast of characters that I could actually care about. There were plenty of suspects, and enough twists and turns to keep me guessing. 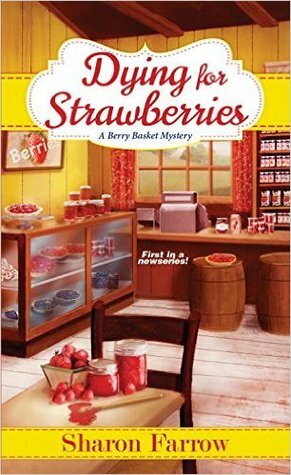 I thoroughly enjoyed the story, and I can’t wait to make some Strawberry Smash muffins! Sharon Farrow is the latest pen name of award winning author Sharon Pisacreta. Born and raised in Detroit, Michigan, Sharon has been a freelance writer since her twenties. Published in mystery, fantasy, and romance, Sharon currently writes The Berry Basket cozy mystery series, and is the editor of the travel site lakeeffectliving.com. She is also one half of the writing team D.E. Ireland, who co-author the Agatha nominated Eliza Doolittle and Henry Higgins mysteries. Visit Sharon at sharonfarrowauthor.com, on Facebook @SharonFarrowAuthor, or Twitter @SharonFarrowBB. NOTE: I received free copy in exchange for an honest review. Congratulations, Shannon. Looking forwar to reading the first book in your new series. Just the name make s my mouth water. Sounds delicious. I saw this post on Alyssa Maxwell’s page and just had to wish you a note.